I think the biggest blessings in life are babies. When you are able to love on them, wear them, enjoy their baby rolls, make them giggle and smile, and then give them back to their mothers. 😉 All of it is the absolute best. The day I became an aunt, I was so excited. Oliver, my nephew, is the first baby in the family so we all have been enjoying our time with him. I believe every mother deserves a little break here and there so I have tried to help out and be there when I can. To me, it’s important to let my nephew know how much his aunt loves him as well as to give his mother a well deserved break. Over the years I’ve helped mothers as a postpartum doula and I know that every mom needs some alone time away from her baby to take care of herself and her needs. If you’re thinking of helping out a loved one and taking care of the baby for a bit, first of all, she will be so grateful! That’s one of the best things you can do for a mom. Next, you will need a few things to help you get through the day with the little guy. Since I can’t bring Oliver’s whole nursery with me when I spend a day with him, I make sure that I have some essentials with me. You honestly don’t need a lot. Here is what I use when spending a day with my nephew, Oliver. When Missy, my SIL, first had Oliver, I helped out with a few nights. Sleep is EVERYTHING for a new parent. I would come over at about 10pm and leave at around 10am that way she could get as much sleep between feedings and didn’t have to worry about the baby. I told her about the importance of swaddling and how to do it correctly. It has helped Oliver sleep much better at night. 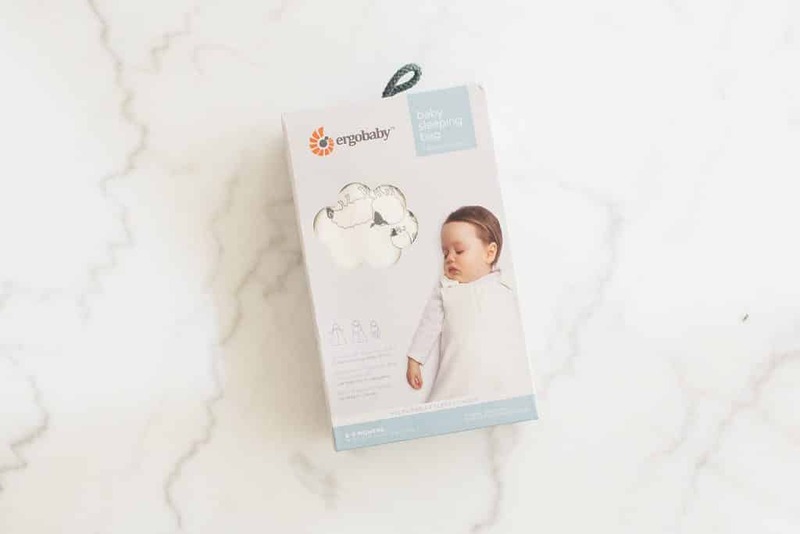 There are so many different swaddles on the market, and one that I love is the Ergobaby swaddlers. 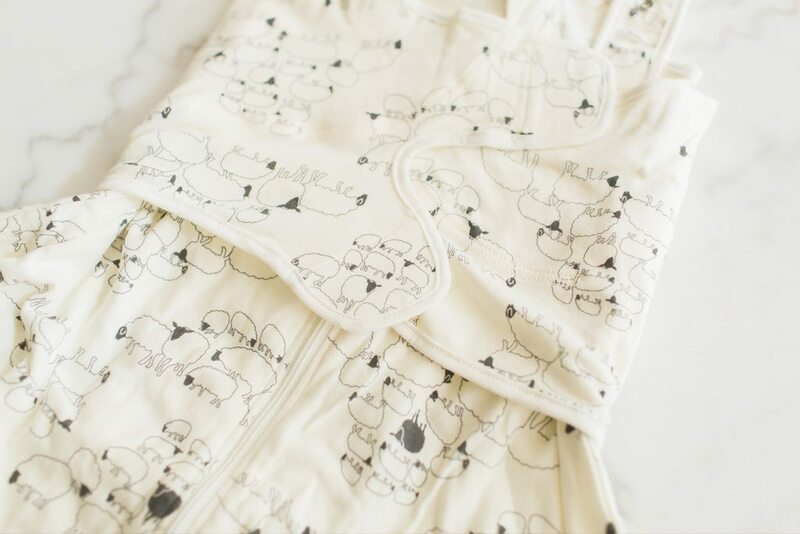 This sheep design is my favorite! 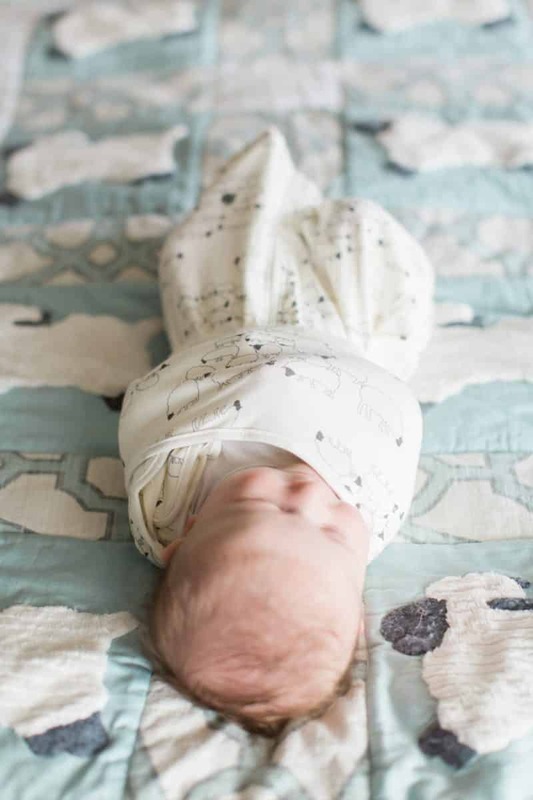 I like this swaddle because it is it’s safe, easy to use and helps keep your baby sleeping longer and more peacefully. How does it do that? 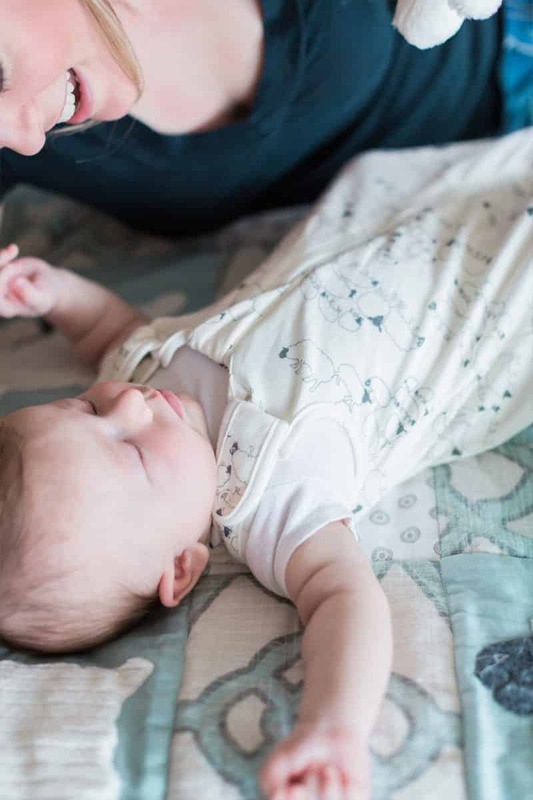 It prevents your baby from waking up from his startle reflex, and the ergonomic design of the swaddle allows for natural movement of baby’s hips and legs as recommended by the International Hip Dysplasia Institute. It’s also nice that the swaddle is made of soft and breathable 100% cotton knit terry which helps regulate baby’s body temperature. The material stretches with any movement and is great for year-round comfort. When I’m spending a day with Oliver, I make sure that we have his swaddle with us for naps. I want him to feel at home and safe, and to continue his sleep routine as he does at home. There are so many little things that you need on hand when you’re out with a baby. You need diapers, wipes, diaper cream, teether toys, a changing pad, bottles, mother’s milk or formula. . . The list goes on. Thank goodness for diaper bags. 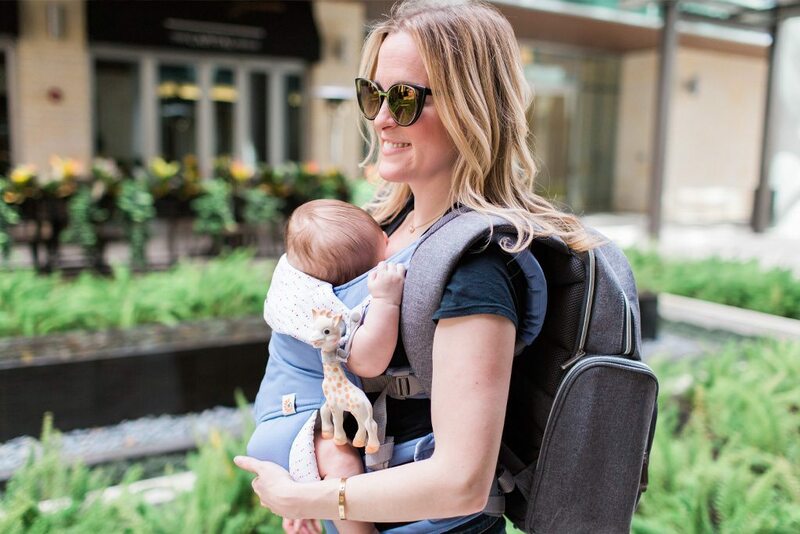 I really like diaper backpacks–especially this one–since they make it easy and comfortable to carry baby’s products and it evenly distributes the weight of the bag on your back. 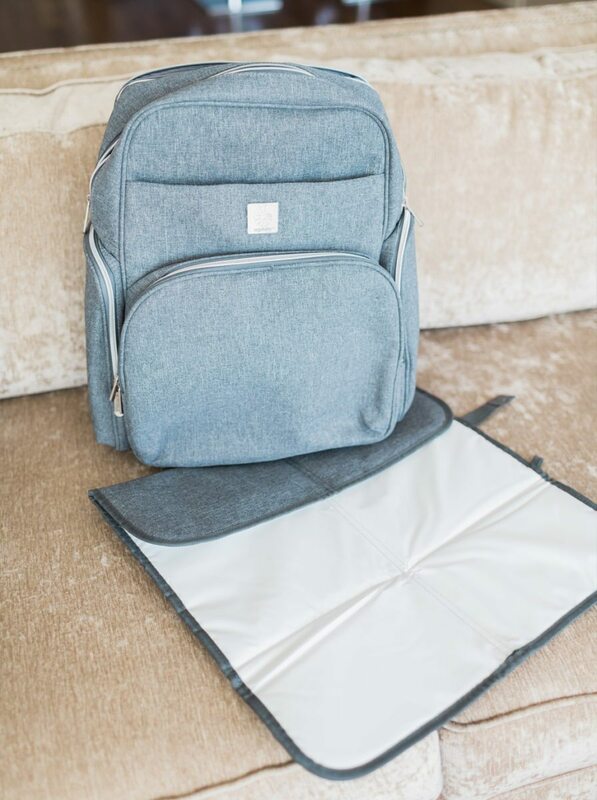 This “Anywhere I Go” backpack diaper bag really caught my eye because it can work perfectly for mom and dad. 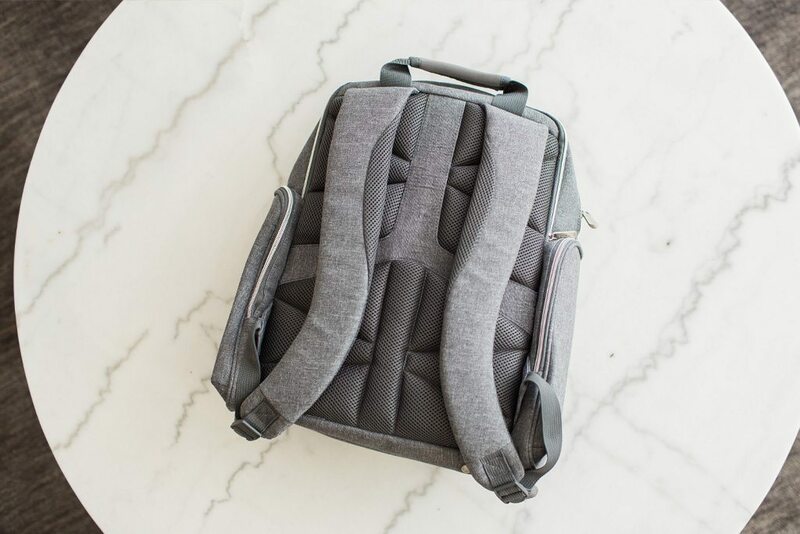 I love that this backpack is neutral, and it’s very well designed and comfortable to wear. It has helped me stay organized every time I’m out with Oliver. 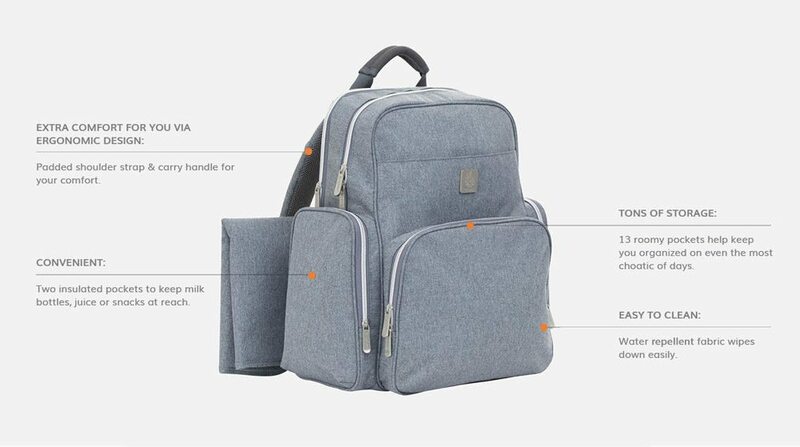 It’s also made of premium water repellent materials and has 13 pockets for lots of easy to reach storage. I definitely give it two thumbs up! 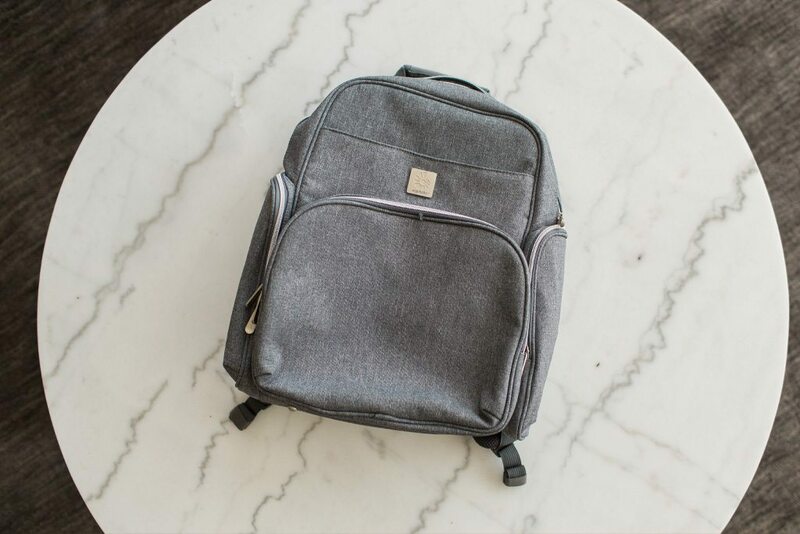 Whether you are a guy or girl wanting to help out your mama friend or family member, this bag will help you keep it all together. I love wearing babies. 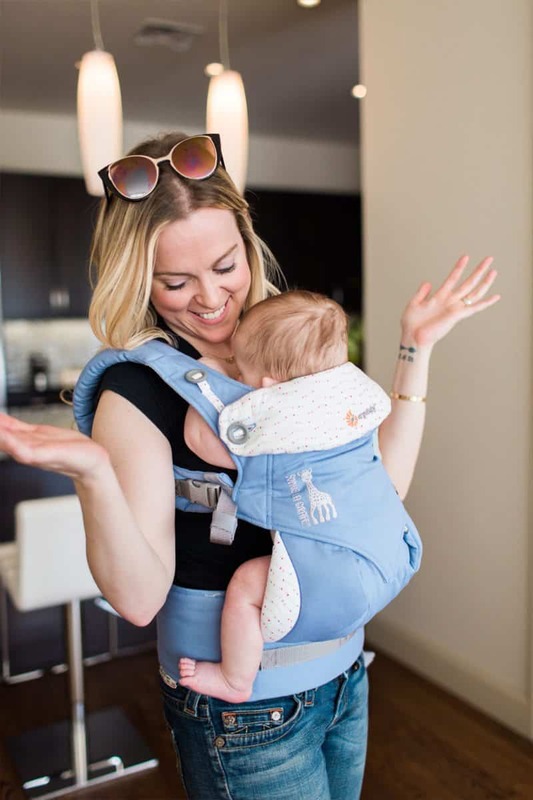 Babies are happiest when they are held and babywearing allows you to have your arms free! The best part is that you don’t event have to keep track of where the little tot is or what they’re doing while wearing them. It’s seriously the best thing ever and makes taking care of the baby so much easier. 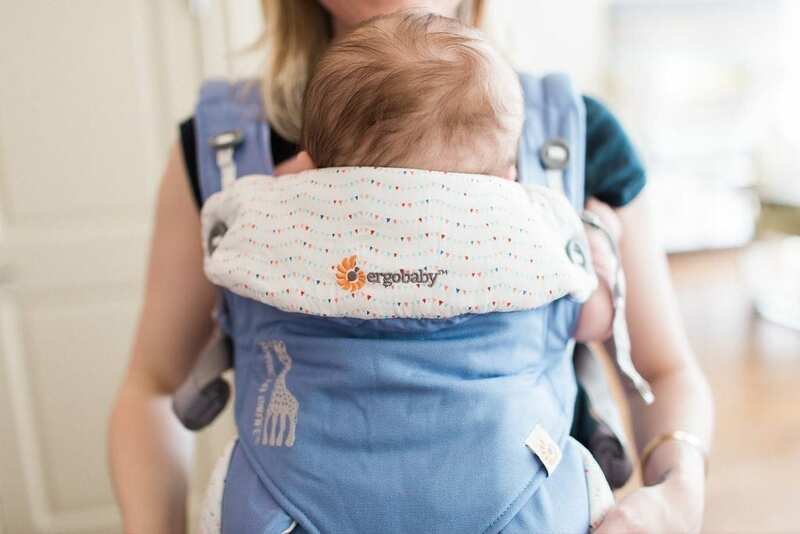 One of my favorite carriers is the Ergobaby 360. It’s phenomenal! 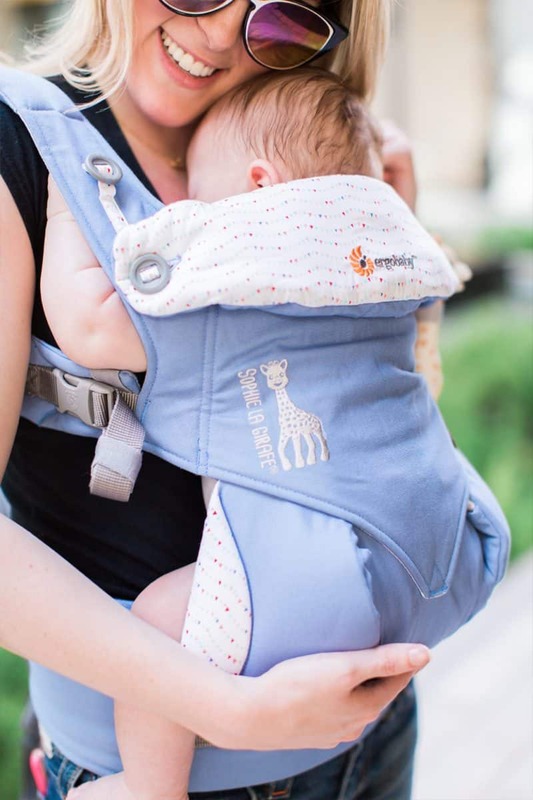 You can wear your baby in all four positions with this carrier: front-inward carry, front-outward carry, hip carry and back carry. 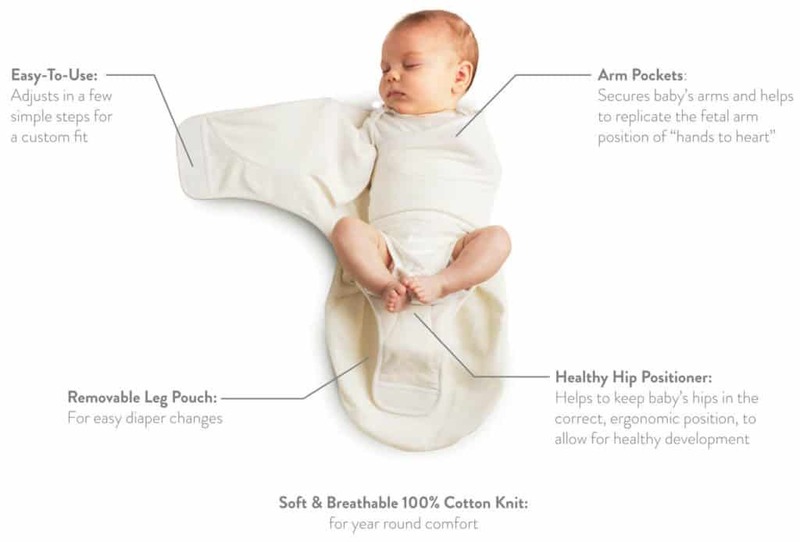 With an infant insert, you can wear your baby from 0-4months (7-12 lbs) and without the insert from 4-24 months (12-26.9 lbs). That’s a great investment piece! 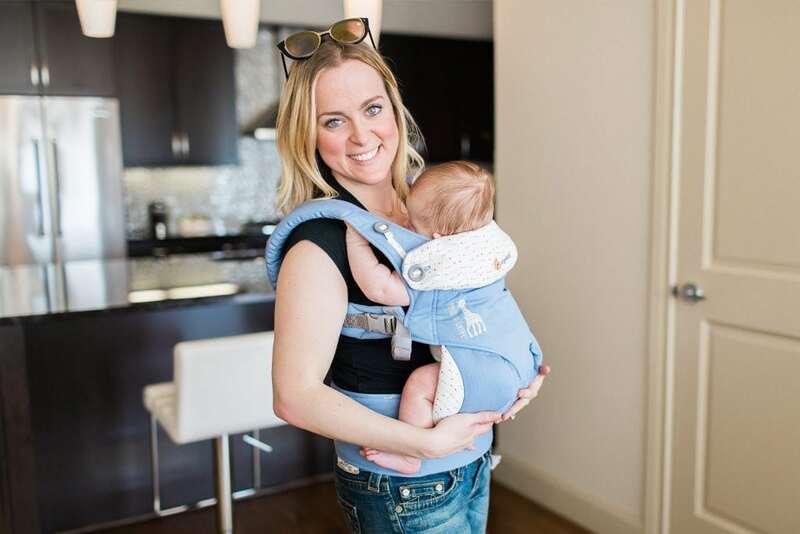 It helps keep your baby in a safe hip position whether your baby is facing inwards or outwards. It’s flexible enough to absorb the shock of walking, making it safe for your spine, as well. 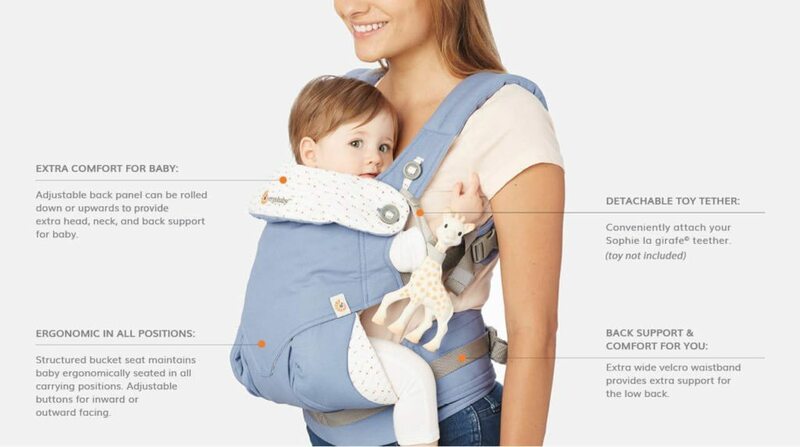 Doesn’t compromise baby’s spine or hip safety. 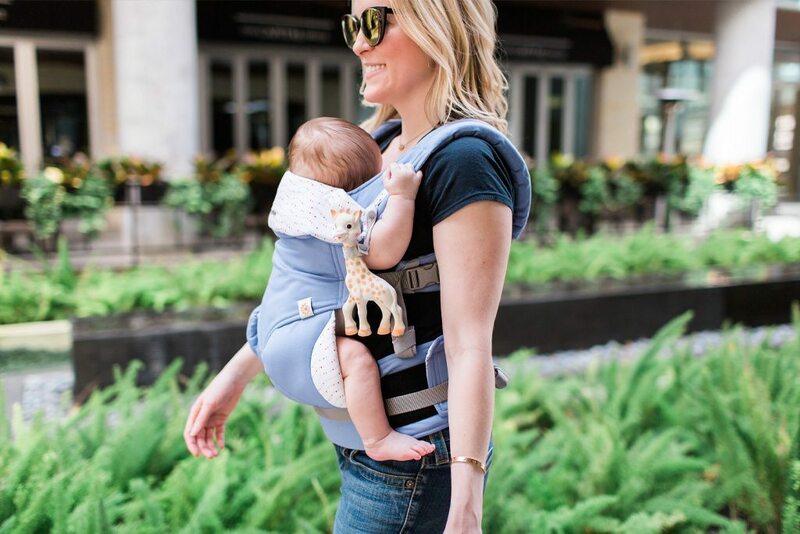 Ergobaby recently partnered with Sophie La Girafe® and created this limited edition Festival 360 4 Position Carrier, in a beautiful periwinkle canvas with an adorable flag lining. I was already a fan of their carriers, but this carrier was too cute to pass up. It even has a place where you can attach your own Sophie Giraffe (toy not included) to the carrier. 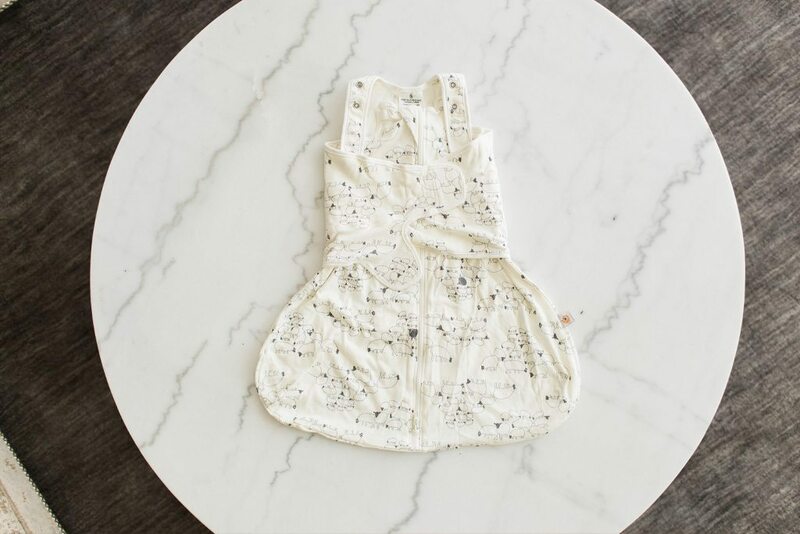 Perfect for when baby needs a teether. Getting out of the house and spending some quality time with Oliver has been a favorite of mine. It allows Missy to have some time for herself and gives me bonding time with my nephew. 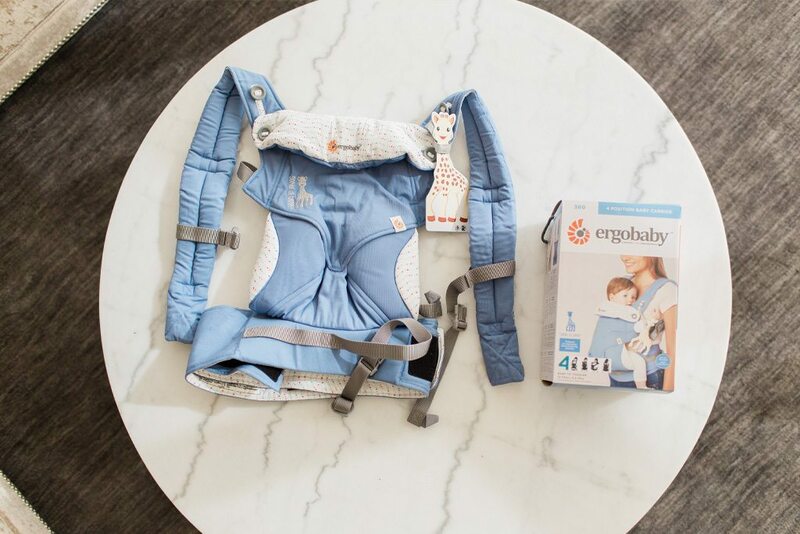 If you’re considering helping out a loved one, these products will make that time easier and more comfortable for you and baby. Hope you enjoy!